With Thanksgiving fast approaching, productive landscapes take on a special meaning. Harvest festivals around the world invite us to be grateful for earth's bounty. 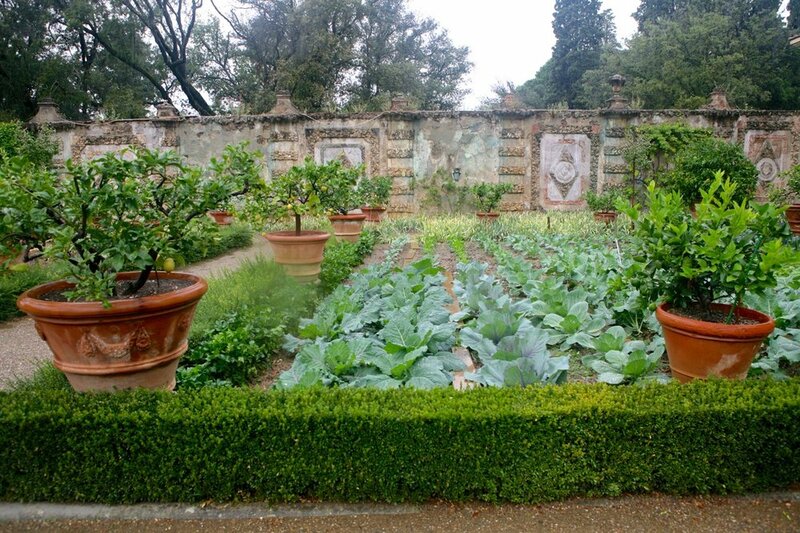 My visit to Villa La Pietra's kitchen garden reminded me that vegetable gardens can be beautiful too - feeding both our bodies and our souls. This kitchen garden has style. Efficiency tends to drive the design of vegetable gardens. 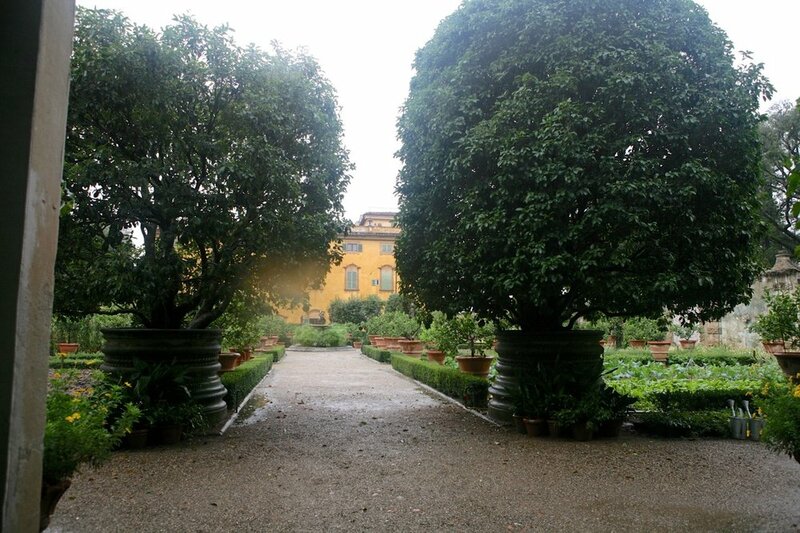 Villa La Pietra’s kitchen garden is different. It combines practicality with history and beauty. The result - an Italian renaissance landscape that is rooted in its heritage, yet alive and in the moment. Simple criss-crossing paths are laid with crushed stone, a central fountain features a mythical mer-boy, and at one end sits a covered structure to over-winter tender plants. Herbs and vegetables fill rectangular beds. Stone walls provide shelter. Flowering containers add color and beauty. A mer-boy sits atop the central fountain. Water loving papyrus makes a bold statement. WHo thought vegetable gardens couldn't have style. 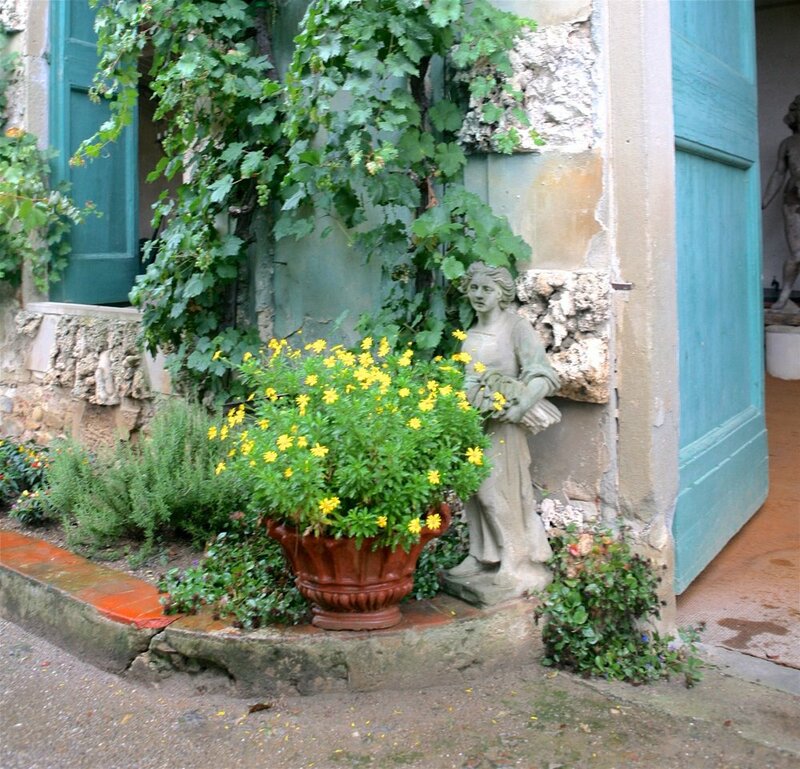 This kitchen garden has style! 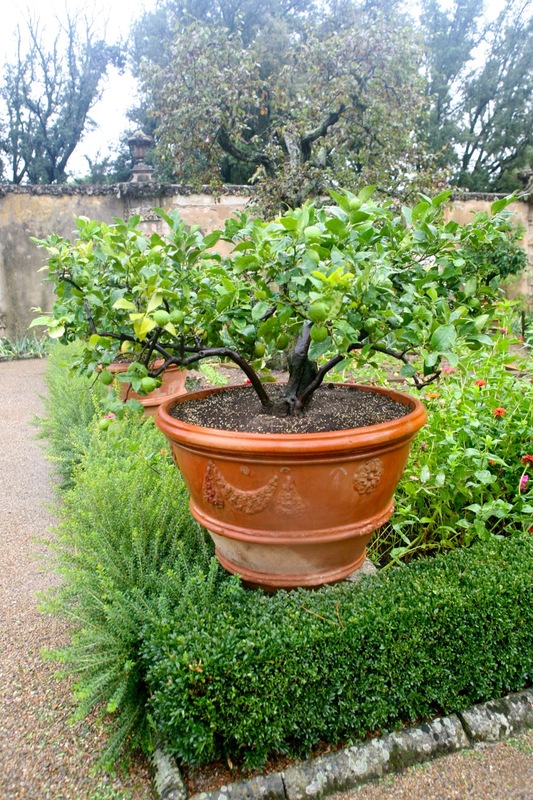 Citrus trees in weathered terra cotta planters line each pathway adding a layer of history to the space. Decades old trees and planters contrast with the rows of tender vegetables planted in the central beds. Water-loving papyrus stalks make a dramatic statement in the fountain. Here, old and new coexist. Villa La Peitra is no museum garden. This area is part of New York University’s “The Greens We Eat“ program. This hands-on workshop celebrates the joy of eating local produce, explores the impact of eating seasonally on the environment, and includes classes in preparing meals with what’s in season. Plantings include broad beans in the spring, tomatoes and zucchini in summer, porcini mushrooms in the fall, and black cabbage in the winter. The Villa is no ordinary place for a local food program. La Pietra was built for a prominent banker in the 1460’s in the Italian renaissance style, with matching formal gardens and terraces surrounding the house. In the 1800's the gardens were torn out and redesigned in the picturesque style - naturalistic slopes, clusters of trees, curved, informal paths. NYU restored the gardens we see above in 1999; their mission is to preserve the “intellectual, cultural and artistic life” of the villa as if the Actons still lived there. The Villa, art collection, and gardens are listed as Cultural Heritage by the Italian Ministry of Fine Arts. The gardens are open to the public by guided tour on select days. Be sure to check their schedule and sign up in advance. Space is limited. 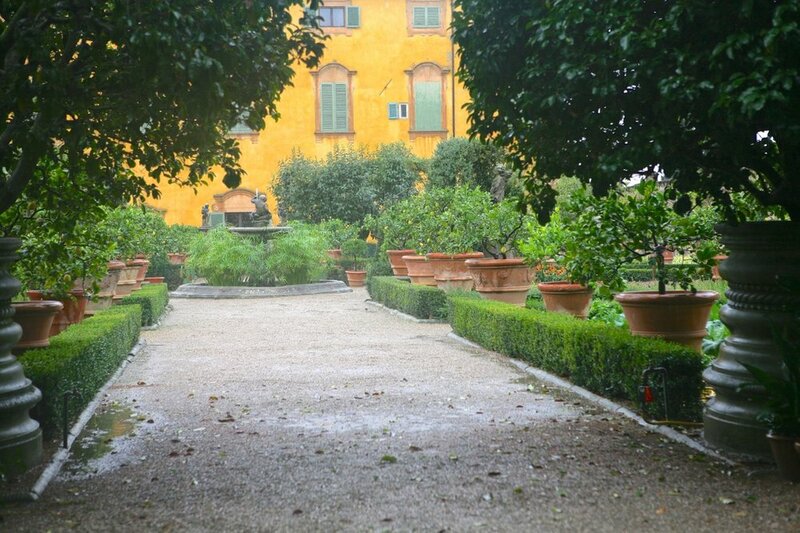 The kitchen garden at La Pietra is a reminder that productive gardens can be quite ornamental; that vegetable gardens can have style. 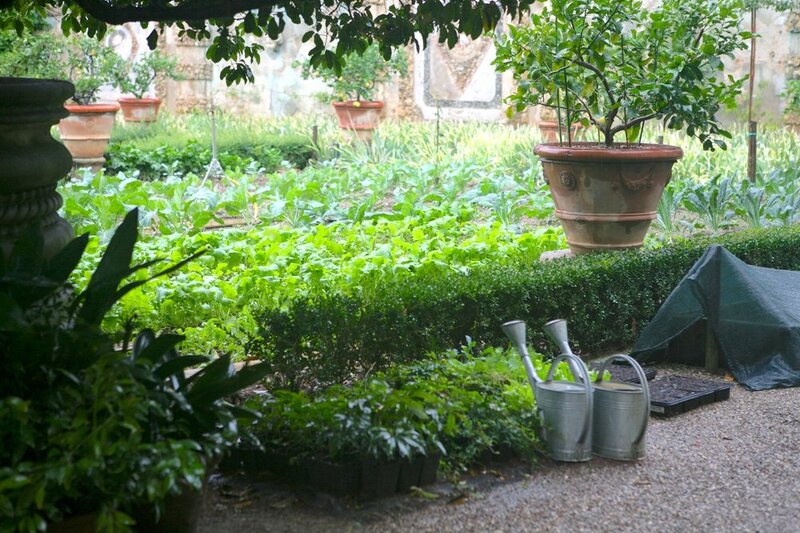 La Pietra makes me want to plan a kitchen garden. How about you? Check out additional posts from my visit to experience the layered history of this amazing garden.